and before the National Electric Light Association, St. Louis, March 1893. Luminosity produced in a gas at ordinary pressure. The first question is: How are these luminous effects produced? In order to answer this question as satisfactorily as I am able to do in the light of accepted views and with the experience acquired, and to add some interest to this demonstration, I shall dwell here upon a feature which I consider of great importance, inasmuch as it promises, besides, to throw a better light upon the nature of most of the phenomena produced by high-frequency electric currents. I have on other occasions pointed out the great importance of the presence of the rarefied gas, or atomic medium in general, around the conductor through which alternate currents of high frequency are passed, as regards the heating of the conductor by the currents. My experiments, described some time ago, have shown that, the higher the frequency and potential difference of the currents, the more important becomes the rarefied gas in which the conductor is immersed, as a factor of the heating. The potential difference, however, is, as I then pointed out, a more important element than the frequency. When both of these are sufficiently high, the heating may be almost entirely due to the presence of the rarefied gas. The experiments to follow will show the importance of the rarefied gas, or, generally, of gas at ordinary or other pressure as regards the incandescence or other luminous effects produced by currents of this kind. First, as in some previous experiments, I connect my body with one of the terminals of a high-tension transformer and take in my hand an exhausted bulb which contains a small carbon button mounted upon a platinum wire leading to the outside of the bulb, and the button is rendered incandescent as soon as the transformer is set to work (Fig. 190). I may place a conducting shade on the bulb which serves to intensify the action, but it is not necessary. Nor is it required that the button should be in conducting connection with the hand through a wire leading through the glass, for sufficient energy may be transmitted through the glass itself by inductive action to render the button incandescent. Next I take a highly exhausted bulb containing a strongly phosphorescent body, above which is mounted a small plate of aluminum on a platinum wire leading to the outside, and the currents flowing through my body excite intense phosphorescence in the bulb (Fig. 191). 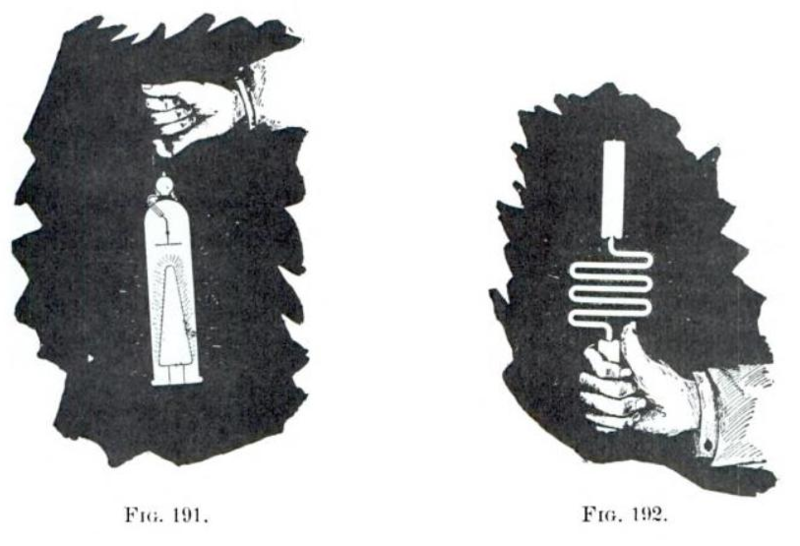 Next again I take in my hand a simple exhausted tube, and in the same manner the gas inside the tube is rendered highly incandescent or phosphorescent (Fig. 192). Finally, I may take in my hand a wire, bare or covered with thick insulation, it is quite immaterial; the electrical vibration is so intense as to cover the wire with a luminous film (Fig.193). A few words must now be devoted to each of these phenomena. In the first place, I will consider the incandescence of a button or of a solid in general, and dwell upon some facts which apply equally to all these phenomena. It was pointed out before that when a thin conductor, such as a lamp filament, for instance, is connected with one of its ends to the terminal of a transformer of high tension the filament is brought to incandescence partly by a conduction current and partly by bombardment. The shorter and thicker the filament the more important becomes the latter, and finally, reducing the filament to a mere button, all the heating must practically be attributed to the bombardment. So in the experiment before shown, the button is rendered incandescent by the rhythmical impact of freely movable small bodies in the bulb. 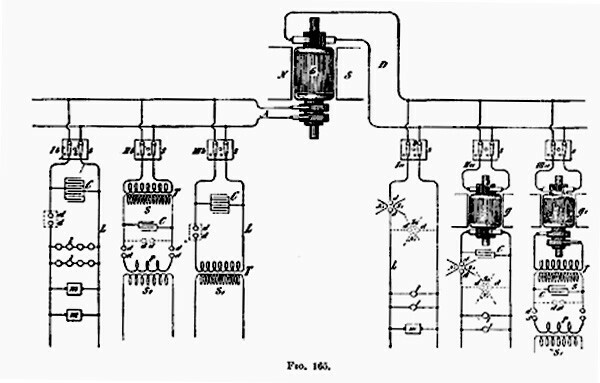 These bodies may be the molecules of the residual gas, particles of dust or lumps torn from the electrode; whatever they are, it is certain that the heating of the button is essentially connected with the pressure of such freely movable particles, or of atomic matter in general in the bulb. The heating is the more intense the greater the number of impacts per second and the greater the energy of each impact. Yet the button would be heated also if it were connected to a source of a steady potential. In such a case electricity mould be carried away from the button by the freely movable carriers or particles flying about, and the quantity of electricity thus carried away might be sufficient to bring the button to incandescence by its passage through the latter. But the bombardment could not be of great importance in such case. For this reason it would require a comparatively very great supply of energy to the button to maintain it at incandescence with a steady potential. The higher the frequency of the electric impulses the more economically can the button be maintained at incandescence. One of the chief reasons why this is so, is, I believe, that with impulses of very high frequency there is less exchange of the freely movable carriers around the electrode and this means, that in the bulb the heated matter is better confined to the neighborhood of the button. If a double bulb, as illustrated in Fig. 194 be made, comprising a large globe B and a small one b, each containing as usual a filament f mounted on a platinum wire w and w1 it is found, that if the filaments f f be exactly alike, it requires less energy to keep the filament in the globe b at a certain degree of incandescence, than that in the globe B. This is due to the confinement of the movable particles around the button. In this case it is also ascertained, that the filament in the small globe b is less deteriorated when maintained a certain length of time at incandescence. This is a necessary consequence of the fact that the gas in the small bulb becomes strongly heated and therefore a very good conductor, and less work is then performed on the button, since the bombardment becomes less intense as the conductivity of the gas increases. In this construction, of course, the small bulb becomes very hot and when it reaches an elevated temperature the convection and radiation on the outside increase. On another occasion I have shown bulbs in which this drawback was largely avoided. In these instances a very small bulb, containing a refractory button, was mounted in a large globe and the space between the walls of both was highly exhausted. The outer large globe remained comparatively cool in such constructions, When the large globe was on the pump and the vacuum between the walls maintained permanent by the continuous action of the pump, the outer globe would remain quite cold, while the button in tile small bulb was kept at incandescence. But when the seal was made, and the button in the small bulb maintained incandescent some length of time, the large globe too would become warmed. Prom this I conjecture that if vacuous space (as Prof. Dewar finds) cannot convey heat, it is so merely in virtue of our rapid motion through space or, generally speaking, by the motion of the medium relatively to us, for a permanent condition could not be maintained without the medium being constantly renewed. A vacuum cannot, according to all evidence, be permanently maintained around a hot body. In these constructions, before mentioned, the small bulb inside would, at least in the first stages, prevent all bombardment against the outer large globe. It occurred to me then to ascertain how a metal sieve would behave in this respect, and several bulbs, as illustrated in Fig. 195, were prepared for this purpose. In a globe b, was mounted a thin filament f (or button) upon a platinum wire w passing through a glass stem and leading to the outside of the globe. The filament f was surrounded by a metal sieve s. It was found in experiments with such bulbs that a sieve with wide meshes apparently did not in the slightest affect the bombardment against the globe b. When the vacuum was high, the shadow of the sieve was clearly projected against the globe and the latter would get hot in a short while. In some bulbs the sieve ,v was connected to a platinum wire sealed in the glass. When this wire was connected to the other terminal of the induction coil (the E. M. F. being kept low in this case), or to an insulated plate, the bombardment against the outer globe b was diminished. 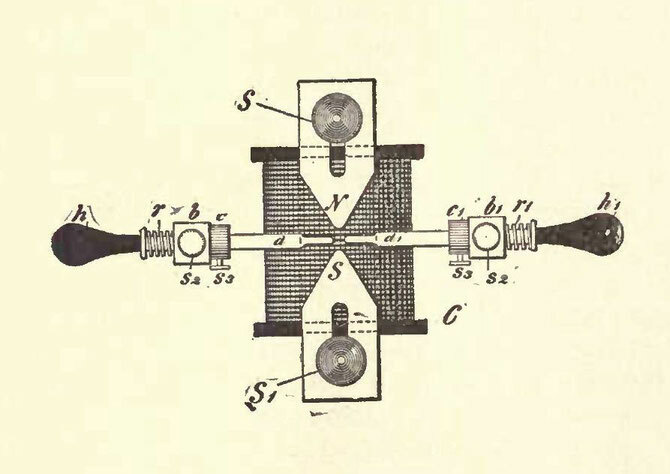 By taking a sieve with fine meshes the bombardment against the globe b was always diminished, but even then if the exhaustion was carried very far, and when the potential of the transformer was very high, the globe b would be bombarded and heated quickly, though no shadow of the sieve was visible, owing to the smallness of the meshes. But a glass tube or other continuous body mounted so as to surround the filament, did entirely cut off the bombardment and for a while the outer globe b would remain perfectly cold. Of course when the glass tube was sufficiently heated the bombardment against the outer globe could be noted at once. 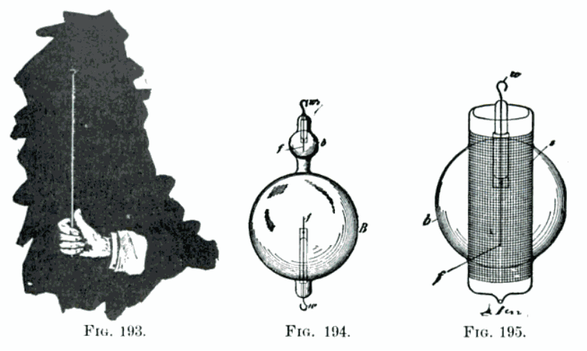 The experiments with these bulbs seemed to show that the speeds of the projected molecules or particles must be considerable (though quite insignificant when compared with that of light), otherwise it would be difficult to understand how they could traverse a fine metal sieve without being affected, unless it were found that such small particles or atoms cannot be acted upon directly at measurable distances. In regard to the speed of the projected atoms, Lord Kelvin has recently estimated it at about one kilometre a second or thereabouts in an ordinary Crookes bulb. As the potentials obtainable with a disruptive discharge coil are much higher than with ordinary coils, the speeds must, of course, be much greater when the bulbs are lighted from such a coil. Assuming the speed to be as high as five kilometres and uniform through the whole trajectory, as it should be in a very highly exhausted vessel, then if the alternate electrifications of the electrode would be of a frequency of five million, the greatest distance a particle could get away from the electrode would be one millimetre, and if it could be acted upon directly at that distance, the exchange of electrode matter or of the atoms would be very slow and there would be practically no bombardment against the bulb. This at least should be so, if the action of an electrode upon the atoms of the residual gas would be such as upon electrified bodies which we can perceive. A hot body enclosed in a n exhausted bulb produces always atomic bombardment, but a hot body has no definite rhythm, for its molecules perform vibrations of all kinds. The button should be as small as possible, spherical, of a smooth or polished surface, and of refractory material which withstands evaporation best. The support of the button should be very thin and screened by an aluminum and mica sheet, as I have described on another occasion. The exhaustion of the bulb should be as high as possible. The frequency of the currents should be as high as practicable. The currents should be of a harmonic rise and fall, without sudden interruptions. The heat should be confined to the button by inclosing the same in a small bulb or otherwise. The space between the walls of the small bulb and the outer globe should be highly exhausted. Most of the considerations which apply to the incandescence of a solid just considered may likewise be applied to phosphorescence. Indeed, in an exhausted vessel the phosphorescence is, as a rule, primarily excited by the powerful beating of the electrode stream of atoms against the phosphorescent body. Even in many cases, where there is no evidence of such a bombardment, I think that phosphorescence is excited by violent impacts of atoms, which are not necessarily thrown off from the electrode but are acted upon from the same inductively through the medium or through chains of other atoms. That mechanical shocks play an important part in exciting phosphorescence in a bulb may be seen from the following experiment. If a bulb, constructed as that illustrated in Fig. 174, be taken and exhausted with the greatest care so that the discharge cannot pass, the filament facts by electrostatic induction upon the tube t and the latter is set in vibration. If the tube o be rather wide, about an inch or so, the filament may be so powerfully vibrated that whenever it hits the glass tube it excites phosphorescence. But the phosphorescence ceases when the filament comes to rest. The vibration can be arrested and again started by varying the frequency of the currents. Now the filament has its own period of vibration, and if the frequency of the currents is such that there is resonance, it is easily set vibrating, though the potential of the currents be small. I have often observed that the filament in the bulb is destroyed by such mechanical resonance. The filament vibrates as a rule so rapidly that it cannot be seen and the experimenter may at first be mystified. When such an experiment as the one described is carefully performed, the potential of the currents need be extremely small, and for this reason I infer that the phosphorescence is then due to the mechanical shock of the filament against the glass, just as it is produced by striking a loaf of sugar with a knife. The mechanical shock produced by the projected atoms is easily noted when a bulb containing a button is grasped in the hand and the current turned on suddenly. I believe that a bulb could be shattered by observing the conditions of resonance. It is a fact that they can be affected by electrostatic force, as is apparent in many of these experiments. By varying the electrostatic force we can agitate the atoms, and cause them to collide accompanied by evolution of heat and light. It is not demonstrated beyond doubt that vie can affect them otherwise. If a luminous discharge is produced in a closed exhausted tube, do the atoms arrange themselves in obedience to any other but to electrostatic force acting in straight lines from atom to atom? Only recently I investigated the mutual action between two circuits with extreme rates of vibration. When a battery of a few jars (c c c c, Fig. 196), is discharged through a primary P of low resistance (the connections being as illustrated in Figs. 183a, 183b and 183c), and the frequency of vibration is many millions there are great differences of potential between points on the primary not more than a few inches apart. 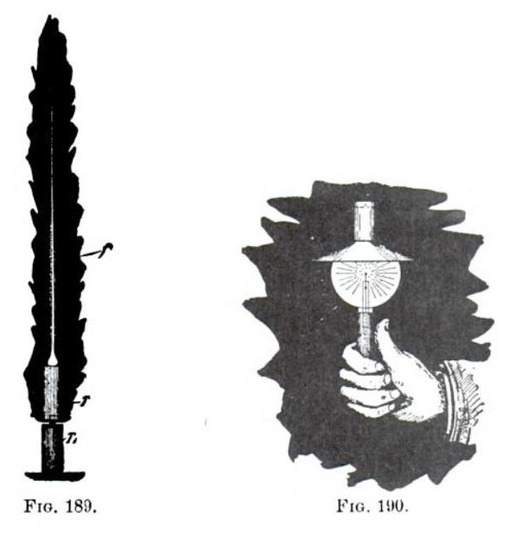 These differences may be 10,000 volts per inch, if not more, taking the maximum value of the E. M. F. The secondary S is therefore acted upon by electrostatic induction, which is in such extreme cases of much greater importance than the electro-dynamic. To such sudden impulses the primary as well as the secondary are poor conductors, and therefore great differences of potential may be produced by electrostatic induction between adjacent points on the secondary. Then sparks may jump between the wires and streamers become visible in the dark if the light of the discharge through the spark gap d d be carefully excluded. If now we substitute a closed vacuum tube for the metallic secondary S, the differences of potential produced in the tube by electrostatic induction from the primary are fully sufficient to excite portions of it; but as the points of certain differences of potential on the primary are not fixed, but are generally constantly changing in position, a luminous band is produced in the tube, apparently not touching the glass, as it should, if the points of maximum and minimum differences of potential were fixed on the primary. I do not exclude the possibility of such a tube being excited only by electro-dynamic induction, for very able physicists hold this view; but in my opinions, there is as yet no positive proof given that atoms of a gas in a closed tube may arrange themselves in chains under the action of an: electromotive impulse produced by electro-dynamic induction in the tube. I have been unable so far to produce striae in a tube, however long, and at whatever degree of exhaustion, that is, striae at right angles to the supposed direction of the discharge or the axis of the tube; but I have distinctly observed in a large bulb, in which a wide luminous band was produced by passing a discharge of a battery through a wire surrounding the bulb, a circle of feeble luminosity between two luminous bands, one of which was more intense than the other. Furthermore, with my present experience I do not think that such a gas discharge in a closed tube can vibrate, that is, vibrate as a whole. I am convinced that no discharge through a gas can vibrate. The atoms of a gas behave very curiously in respect to sudden electric impulses. The gas does not seem to possess any appreciable inertia to such impulses, for it is a fact, that the higher the frequency of the impulses, with the greater freedom does the discharge pass through the gas. If the gas possesses no inertia then it cannot vibrate, for some inertia is necessary for the free vibration. I conclude from this that if a lightning discharge occurs between two clouds, there can be no oscillation, such as would be expected, considering the capacity of the clouds. But if the lightning discharge strike the earth, there is always vibration—in the earth, but not in the cloud. In a gas discharge each atom vibrates at its oven rate, but there is no vibration of the conducting gaseous mass as a whole. This is an important consideration in the great problem of producing light economically, for it teaches us that to reach this result we must use impulses of very high frequency and necessarily also of high potential. It is a fact that oxygen produces a more intense light in a tube. Is it because oxygen atoms possess some inertia and the vibration does not die out instantly? But then nitrogen should be as good, and chlorine and vapors of many other bodies much better than oxygen, unless the magnetic properties of the latter enter prominently into play. Or, is the process in the tube of an electrolytic nature? Many observations certainly speak for it, the most important being that matter is always carried away from the electrodes and the vacuum in a bulb cannot be permanently maintained. If such process takes place in reality, then again must we take refuge in high frequencies, for, with such, electrolytic action should be reduced to a minimum, if not rendered entirely impossible. It is an undeniable fact that with very high frequencies, provided the impulses be of harmonic nature, like those obtained from an alternator, there is less deterioration and the vacua are more permanent. With disruptive discharge coils there are sudden rises of potential and the vacua are more quickly impaired, for the electrodes are deteriorated in a very short time. 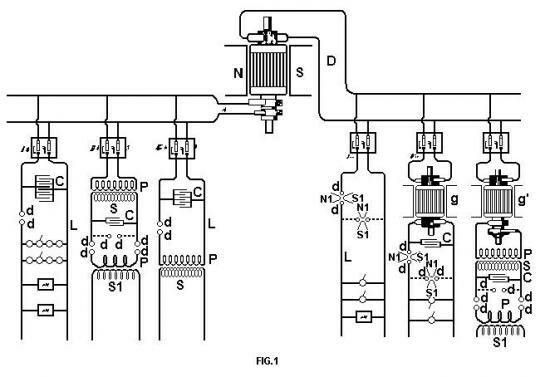 It was observed in some large tubes, which were provided with heavy carbon blocks B B1, connected to platinum wires w w1 (as illustrated in Fig. 197), and which were employed in experiments with the disruptive discharge instead of the ordinary air gap, that the carbon particles under the action of the powerful magnetic field in which the tube was placed, were deposited in regular fine lines in the middle of the tube, as illustrated. These lines were attributed to the deflection or distortion of the discharge by the magnetic field, but why the deposit occurred principally where the field was most intense did not appear quite clear. A fact of interest, likewise noted, was that the presence of a strong magnetic field increases the deterioration of the electrodes, probably by reason of the rapid interruptions it produces, whereby there is actually a higher E. M. F. maintained between the electrodes. Much would remain to be said about the luminous effects produced in gases at low or ordinary pressures. With the present experiences before us we cannot say that the essential nature of these charming phenomena is sufficiently known. But investigations in this direction are being pushed with exceptional ardor. Every line of scientific pursuit has its fascinations, but electrical investigation appears to possess a peculiar attraction, for there is no experiment or observation of any kind in the domain of this wonderful science which would not forcibly appeal to us. Yet to me it seems, that of all the many marvelous things we observe, a vacuum tube, excited by an electric impulse from a distant source, bursting forth out of the darkness and illuminating the room with its beautiful light, is as lovely a phenomenon as can greet our eyes. More interesting still it appears when, reducing the fundamental discharges across the gap to a very small number and waving the tube about we produce all kinds of designs in luminous lines. So by way of amusement I take a straight long tube, or a square one, or a square attached to a straight tube, and by whirling them about in the hand, I imitate the spokes of a wheel, a Gramme winding, a drum winding, an alternate current motor winding, etc. ( Fig. 198). Viewed from a distance the effect is weak and much of its beauty is lost, but being near or holding the tube in the hand, one cannot resist its charm. Excellent presentation of information! Shame only 10% of the world population has the intellect to comprehend or desire to research by methods other than a video. Well done and keep up the excellent work, very enjoyable read.